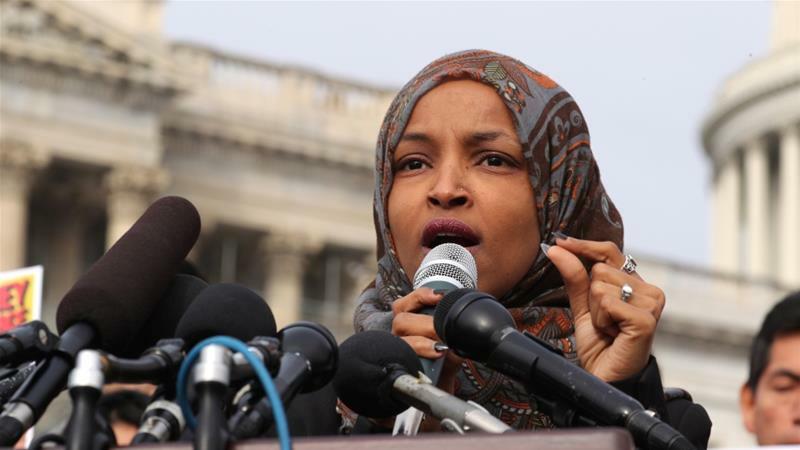 Recent weeks have seen a concerted campaign coming primarily from the right, but also from the leadership of the Democratic Party, targeting Representative Ilhan Omar (D-MN) for making comments about the relations between the right-wing pro-Israel lobby group, AIPAC, and U.S. politicians. The attacks from the right have an outright Islamophobic tinge, but they are also part of a wider campaign directed not just at Omar but the new left in Congress and in society using the charge of “anti-Semitism.” The horrific terrorist attack by a self-described fascist on mosques in New Zealand last Friday following on from massacre of Jewish worshippers in Pittsburgh by another self-avowed white supremacist makes it urgent to clarify where the real source of vicious anti-Semitism and Islamophobia comes from. Responding to the attack, some Democratic figures came out in Omar’s defense. Most notably, three presidential candidates have sided with Omar. Bernie Sanders commented “what I fear is going on in the House now is an effort to target Congresswoman Omar as a way of stifling that debate.” Elizabeth Warren said that “Branding criticism of Israel as automatically anti-Semitic has a chilling effect on our public discourse and makes it harder to achieve a peaceful solution between Israelis and Palestinians.” Even Kamala Harris, who is more clearly part of the Democratic establishment said “I am concerned that the spotlight being put on Congresswoman Omar may put her at risk,” a reference to the death threats against her from the right. In the past, figures like Sanders and Warren might have been less likely to take such a clear position. This shows the widening division within the Democratic Party reflected by the election of self-described “democratic socialists” of Alexandria Ocasio-Cortez, Rashida Tlaib, and the political pressure on Bernie Sanders, who himself is facing demands from the left to take a stronger stand against the Israeli regime of Benjamin Netanyahu. Facing increasing pushback and the virulent campaign from the right, Pelosi and others toned down their criticism of Omar. Their main argument has shifted into insulting those who criticize the Israeli government by claiming that they are ignorant either about the complexities of the Middle East or about the way their words can be translated as anti-Semitic. The Democrats in the House also put forward an empty resolution that rejects anti-Semitism, as well as other types of racism. These attacks on Omar are a continuation of a long-standing tactic by the corporate establishment and media in the U.S. of branding any criticism of the policies of the Israeli government as anti-Semitic. It is not only “about the Benjamins” as Omar claimed in a tweet. But criticizing the Israeli government means, in effect, criticizing U.S. policy in the Middle East. Only a few months ago, Marc Lamont Hill lost his job with CNN and was forced to apologize for criticizing Israel’s occupation of the Palestinian territories during a speech at the U.N.
A recent New York Times opinion by Bret Stephens had this sub-headline: “The Minnesota Democrat is bringing Corbynism to the Democratic Party,” referencing the left-wing leader of the British Labour Party, Jeremy Corbyn. He is under ferocious attack by the British right wing, including from members from his own party, for alleged anti-Semitism. This campaign is based on massive and systematic exaggeration while the anti-Semitism of the far right and within the right-wing Conservative Party is largely ignored. Besides attacking Omar, the establishment has gone after those who expressed public support for the Boycott, Divestment, and Sanctions (BDS) campaign which demands that Israel end the occupation of Palestinian land. A few days before Omar’s tweets, the U.S. senate passed a bill with a 77-23 bipartisan vote that allows states to target and refuse to do business with companies who have boycotted Israel. A year ago, the New York State Senate passed a similar bill. While we have disagreements with some aspects of BDS, we completely oppose these attacks on the democratic right to advocate this position. This is a panicked reaction to the growing criticism of Israeli policy within U.S. society in the last few years, especially since the 2009 and 2012 Israeli attacks on Gaza. With the rise of the racist right-wing Netanyahu government in Israel, a growing number of people in the U.S. find it more and more difficult to support Israeli policies toward the Palestinian population. The government has no solution besides more bloodshed. Thousands of Palestinian civilians have died in recent years by the hands of the Israeli government, particularly during Operation Protective Edge. Over ten thousand people, many of them children, were injured. The people of Gaza continue to starve without any real prospect of ending their misery under the Israeli-Egyptian blockade. In the West Bank, Palestinians still live under occupation, denied freedom of movement and a decent life. Last year’s massacre of protestors during the Great March of Return, while the U.S. opened its embassy in Jerusalem, was particularly grotesque. On top of that, the Nationality Law was rightfully seen as a blatant attack on the democratic rights of non-Jews within Israel. The rejection of Israeli policy can especially be seen with young Jewish Americans who join left-wing Jewish organizations and organize walkouts of Birthright trips to Israel. Even J Street, a pro-Israel liberal lobby group went so far as to support Palestinian American Rashida Tlaib until they withdrew their endorsement for her opposition to a two-state solution. While Socialist Alternative completely defends Omar’s right to criticize the policies of the Israeli elite and to expose their real relations with U.S. politicians, this does not mean we necessarily agree with how she has posed the issues now or in the past. Recently, both Omar and Tlaib made references to some U.S. politicians holding “dual loyalty.” This is a bad line of attack that used to be raised by the pro-capitalist right against socialists in regards to the Soviet Union. It was also used in the 19th and early 20th centuries against Catholic immigrants by suggesting their real loyalty was not to the U.S. but to the Pope in Rome. Islamophobia likewise questions whether Muslims can be “loyal Americans.” Marxists do not pose the question of support for reactionary regimes abroad in terms of “national loyalty.” We stand rather for international solidarity of working people and all the oppressed against imperialism and all its client states. In 2012, Omar tweeted that “Israel has hypnotized the world, may Allah awaken the people and help them see the evil doings of Israel.” Tight U.S. support for Israel is not a result of some medieval dark magic, but of the real interests of imperialism in this critical region. Without understating the role of AIPAC, it is not the determining factor in the overall policy of the U.S. It is of course of true that politicians regularly bought and sold by lobby money, but we need to be more clear about whose interests are being served. The whole policy of the U.S. towards the Israeli state has been based on advancing the financial interests of U.S. companies in the Middle East and not on the fake “caring” for the security of the Israeli people. The U.S. tightened its relations with the Israeli elite after the 1967 War, when Israel occupied Gaza, the West Bank, the Golan Heights, and the Sinai Peninsula. During that war, Israel asserted itself as a regional power and switched allegiance from the declining powers of Britain and France to the now dominant U.S. imperialism. A strong Israeli garrison allowed the U.S. to protect its oil interests and defend against Soviet influence in the region. The U.S. capitalist class and its hired politicians couldn’t care less about the safety of Israeli citizens or about the alleged defense of democracy in the Middle East. U.S. threats to invade Venezuela, as well as its record around the world and particularly in the Middle East and Latin America, shows that protecting democracy has never been a priority for the U.S. government. These attacks do another injustice when they seek to hide the debates in Israeli society and the fact that criticism over government policy has always been extremely common in such a politically divided country. Instead, Israeli-government supporters abroad are trying to paint a fake picture of Israeli unity around the horrific policies of the Netanyahu government. In reality, significant sections of Israeli society are fierce opponents of Netanyahu and his pro-capitalist and right-wing agenda. Ironically, it was Benjamin Netanyahu who, a few years ago, went on and on about how sections of the Israeli left, including human rights organizations, are allegedly controlled by European money. None of the “supporters of Israel” made a sound when Netanyahu went after these groups, arguing that donations from foreign countries are “blatant intervention in internal Israeli affairs.” Of course, Netanyahu has no problem with foreign support from right-wing organizations in Israel. And while Omar and Tlaib are criticized for suggesting that some politicians have “dual loyalty,” Israeli right-wing politicians make regular attacks on Palestinian citizens of Israel and on the left as either having dual loyalty, as traitors, or as outright terrorists. Again, not a peep is heard is heard from the shining knights of freedom and democracy in the U.S. establishment. Unfortunately, some sections of the U.S. left who stand against the brutality of the Israeli regime toward the Palestinian people paint the entire Israeli society as one unified bloc of reaction. These leftists also downplay the potential role or even the existence of the Israeli working class. This approach misses the real political divisions within Israeli society – class divisions. Fighting the right-wing Netanyahu government is first and foremost the task of the Israeli and Palestinian working class. The large protests against the racist Nationality Law, particularly the joint Jewish-Palestinian protests, show only a glimpse of what is possible. This false approach of some on the left is, in reality, aiding the right-wing in painting some on the left as anti-Semites. A real fight to an end to Israeli brutality and occupation would require winning over working-class Israelis into a united fight against the government of the bosses. The deep history of class struggle in Israel show that this is not only a possibility, but in fact the only solution. To be clear, Ilhan Omar does not echo this approach but neither, unfortunately, does she or the other left representatives in Congress point to how a real struggle based on mass working-class action could unite Israeli and Palestinian working-class people against the right-wing regime and build international working-class solidarity abroad. But while we have disagreements with some on the left, a more insidious process is taking place in order to discredit the whole left as anti-Semitic. This is a complete historic distortion about the roots and base of anti-Semitism, now being twisted around to shift blame away from its real home in the camp of the right wing. As far back as the 19th and early 20th century, the Russian Tsar collaborated with proto-fascist right-wing gangs (the “Black Hundreds”) who committed mass murders and drove millions of Jews out of the country. The subsequent rise of fascism in Europe during the 1920s frequently targeted socialism and the Jewish people simultaneously because of the massive role of Jewish workers and intellectuals in trade unions and social democratic and Communist parties. In the U.S., the KKK historically targeted Jews as well as black people and the far right has always connected Jews and communism. In the ‘30s and ‘40s anti-Semitism was promoted by figures in the U.S. capitalist class, such as Henry Ford and right-wing political and cultural figures who, again, spread suspicions of Jewish figures as Communists. As the Nazis occupied country after country and slaughtered any “enemies of the state” sections of the capitalist class stood silent or actively supported Hitler partly because of the financial connections between them and Germany. A lot more can be said about that. But we don’t need to go this far. It is enough to look at the rise of Trump and its impact on the growth of overt anti-Semitism. This normalizing of the far right by Trump of course contributed to the hideous massacre at a Pittsburgh synagogue last year, the most deadly attack on Jewish people in U.S. history. Trump, while hypocritically attacking Omar, has made openly anti-Semitic remarks linking Jews and money when he told the Republican Jewish Coalition that everybody knows how to negotiate “in this room, perhaps more than in any room I’ve ever spoke at” and that “you’re not going to support me because I don’t want your money… you want to control your own politicians.” It was also revealed that Trump has several times retweeted from a white supremacist anti-Semitic group. But behind the hypocritical rants of the right wing about “left-wing anti-Semitism,” it is easy to see how U.S. and Israeli establishment are fine with anti-Semitism as long as it comes from a “friendly” face. Actual anti-Semitic parties have gained strength in a number of countries, particularly in Eastern Europe since the fall of Stalinism, but all of these are right wing and many are friends of Trump and the Israeli regime. In the last few years, Netanyahu has made new and very strong connections with some of the world’s most open anti-Semitic leaders. Among Netanyahu’s guests of honor in the last period were Hungary’s right-wing anti-Semitic Prime Minister Viktor Orbán. Orbán is known for anti-Semitic conspiracy theories about a liberal Jewish takeover of Hungary, focused on Hungarian-American billionaire George Soros. He has also praised WW2-era Hungarian admiral who collaborated with the Nazis and helped to send half a million Jews to Auschwitz. Recently Figyelo, a Hungarian business magazine whose owners are close to Orbán published a cover featuring the president of the Hungarian Jewish Federation surrounded by money. Another friend of Netanyahu is Polish Prime Minister, Mateusz Morawiecki, who in secret recordings made anti-Semitic comments and has passed a law making it illegal to put any blame for Nazi crimes on the Polish nation, effectively cleaning the hands of Polish fascists who played a role in the mass murder of Jews during World War II. The punishment for connecting the Polish nation to those crimes can be three years in prison. But if that’s not enough, another close ally of the Israeli right-wing government is the notorious Philippines president Rodrigo Duterte who openly wished he could be the Filipino Hitler and massacre millions of people involved with illegal drugs, like Hitler killed millions in Germany. With such friends, hypocrisy is celebrated in Washington and Jerusalem. But it’s not only that anti-Semitism has historically based itself on the right-wing of the political map, but the fiercest fighters against anti-Semitism and any kind of oppression have always come from the left, particularly the ranks of organized labor and socialist organizations. It was the socialist revolution of Russia in 1917 that banned anti-Semitism and actively fought to create a truly equal society. It was unions and socialist organizers in Europe who stood until their last breath against fascist reaction. In a response to the pro-Nazi German American Bund’s 20,000 rally in Madison Square Garden in 1939, the Trotskyist Socialist Workers’ Party organized 50,000 in counter-protest. Workers and socialists in Britain stopped the rise of Oswald Mosley’s British Union of Fascists at the battle of Cable Street in 1936. And today it is the role of organized workers and socialists to stand firm against any type of racism and oppression as well as to defend freedom of speech. The fight against anti-Semitism, Islamophobia, and all forms of oppression is tied to the fight against capitalism. Socialist Alternative stands for the eradication of racism, for the freedom to criticize, and for a socialist society, where all types of oppressions are thrown in the trash bin of history.